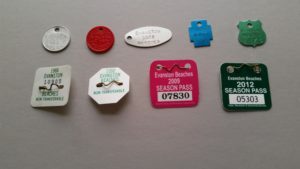 As summer is drawing towards its close, you may be thinking about the fun in the sand you and your family have experienced using your Evanston Beach Tokens. These tokens began to be used in 1931,only on some of the beaches. There were free beaches at Calvary, Lincoln and Lake St. Beaches and token beaches at Main St. and South Blvd. By 1939, there were 9 beaches open. Some were still free and some token beaches. There was also a 2 tiered system for the pay beaches. Some required $3.00 tokens and some $2.00 tokens. The number of amenities provided at the various beaches was used to justify the difference in token costs. It should be noted that the $3.00 token allowed a family to swim at any Evanston beach for the entire summer. The $2.00 token provided access to the $2.00 beaches only. In 1939 and 1968, the city was sued by parties seeking to abolish the beach token charges. The city successfully defended itself in both instances and the beach tokens remained. Over the years, beach tokens have been made of various materials. They were metal in the 1930’s, became plastic during the years of WWII, returned to metal in 1946 and remained so until 1979 when they became a cloth patch for one year only. From the 1980’s through the present they have been plastic with pin backs. The Evanston History Center has a large collection of beach tokens from 1931 through the present, but,there are gaps. We are seeking to fill these in and are asking the public to consider donating missing years. These are: 1932-1934, 1941, 1947-1949, 1950-1957, 1960-1961, 1968, 1981-85, 1989, 1990-1996, 2004-2005, 2007, 2013. Northwestern University also has had beach tokens. We only have tokens from 1935 and 1960. So, we are also interested in building a complete collection of these.